Reteti is located in an extremely remote area which is ideal for elephant rescue and rehabilitation efforts but lacks access to electricity. Supporting the orphanage’s conservation efforts, GivePower installed solar power to help provide critical communications for the rangers as well as much needed refrigeration for food and medicine. The solar also benefits the women and men who live onsite and provide 24/7 care for the elephants. Reteti is an exceptionally special place. 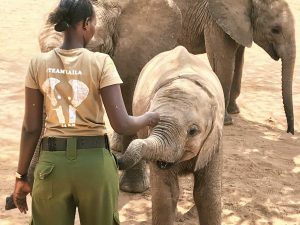 From saving elephants, to helping the local economy and empowering women, Reteti is truly making a positive impact in their community. The GivePower team is honored to support the vital work that they do and the magnificent “eles” who live there.